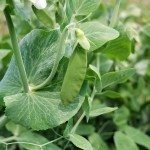 Why do we not want the peas to swell in the pod? I would think a fat juicy pea fully mature would be ideal. Snow Peas are meant to be eaten as a pod. If the peas get large they are bitter.